"Drag & Drop Zones" is a new and innovative way to search the internet. To search from various search engines, just select a phrase and drop it in the zones. Beside enhancing your search experience, the extension allows you to add multiple internal functionalities that are available in the traditional right click menu as zones. Basically by using this extension, you can eliminate the need to do right-clicking on pages or links. What is Drag & Drop Zones extension and how does it work? You can simply drag a Search Engine onto 1 (or more) DropZones to link them. Once you are all set up, you can just drag some text or a link on any website to activate the Drag & DropZones. A stylish transparent grid (in the color of your choice) with all your Search Engines will be displayed over the site you where viewing, and the DropZone you are currently hovering above will be highlighted. Just Drop the text on any of the DropZones and your search will be performed the way you where used to. The Drag & DropZones feature was initially created for my Web Search Pro add-on, since I received many requests from people who loved the idea, but thought that Web Search Pro had just a bit too much features for them, I decided to rewrite the concept to be compatible with the Firefox Web Search itself. How can I use Drag & Drop Zones extension? Simply just drag some text or a link on any website to activate the Drag & DropZones! Is Drag & Drop Zones extension e10s compatible? 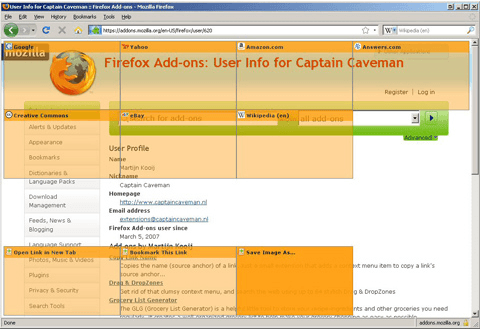 The classical extension is not compatible with Firefox e10s (multi-processor compatible). However there is a new WebExtension version which is fully e10s compatible. Take a look at https://addons.mozilla.org/firefox/addon/drag-dropzones-revived/. Is it possible to change the destination URL for default search engines? Yes, go to the options page and modify the URL. Note the %q; will be replaced with the dropped query. Can I modify the default grids and their locations? Yes, open the options page and drag engines to the new locations. You can also double-click the left side command box to insert a new engine.